Somehow, I drift off to sleep. It is a feat akin to napping during a performance of Tchaikovsky’s 1812 Overture. On the floor of the percussion section. Between kettle roll and cannon fire. When I open my eyes at last, the mechanized chaos has been replaced by a soothing sound: the cooing of doves. It brings to mind a line from the Song of Songs: “the sound of the turtledove (tor) is heard in our land” (2:12). I listen. It is an avian purr. They call out their Hebrew name with very birdie breath: “tor,” “torrr,” “torrrrrrr.” The onomatopoetic exercise is an impromptu vocabulary lesson! The Oriental Turtle Dove (Streptopelia orientalis). Image source. In the midst of this concert, the dawn rubs my shoulder. I shiver. I go full burrito and wrap myself in a foil-film “emergency blanket.” From this position, eyes-up, I watch the Galilean world awaken through the tent screen. The sky goes next. It turns pink. The trees follow. They go pewter, then green. I mull over the situation. The coming day has much potential, but I fear I am not on top of my game. I am chafed, dehydrated, burned, stinky, and sleep deprived. It is grad school all over again. Probably not the best time to wander alone over the rim of the Great Rift Valley either. Am I gaining wisdom with experience? 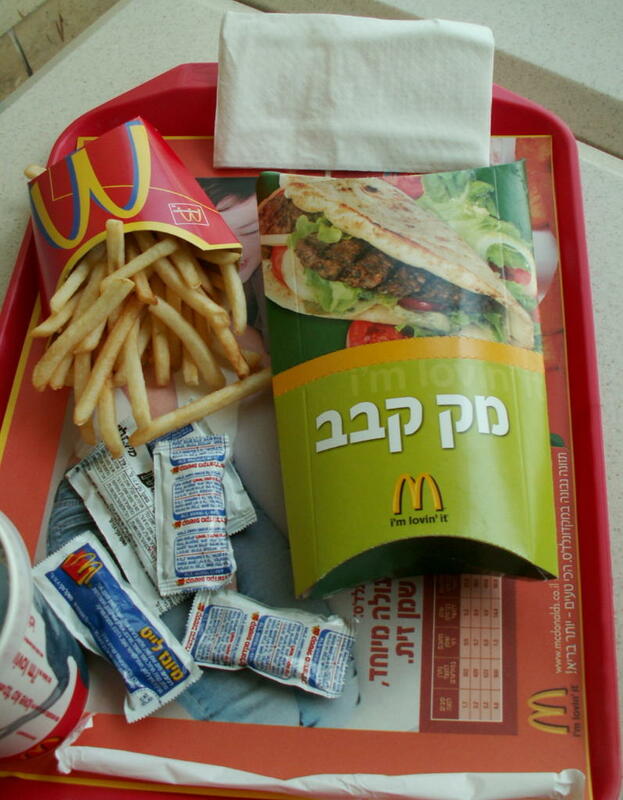 Two alternative goals take shape: first, a burger from McDonald’s (let’s not call it at HAM-burger in Israel-Palestine, shall we?). Second, a visit to the “Green Goat.” Both hold promise for revival. The golden arches rise on the other side of the construction zone. I’ve seen this beacon many times. Fact is, whenever we approach the Golani Interchange with a full bus of plaque-clogged Americans, I listen for their excitement. It has only been two days since leaving the States, but the need for Micky-D’s is approaching crisis proportions. They moan, writhe, and take pictures of the “McDrive” sign to show their friends back home. “Mmm!” “Mmmm!””Mmmmmm!” I hear their little birdie breaths. Then we blow by. The torture is exquisite. View to the new construction at the Golani Interchange in the Galilee. The McDonald’s is on the far side of the highway; my campsite, in the trees on the right. I scold them, but am I any different? My own fast-food fast has been a bit longer, a couple of months maybe. In my weakened state, still cocooned in Saran wrap, the fixation grows: I must have a burger! But will the McMonopoly make one for breakfast? Haunted by this question, I crawl out, dress, and roll up my gear. I make for the highway. I cut through a gas station parking lot and arrive at the guardrail. A four-laner is going in. Construction barricades present an unfriendly maze of steel and concrete. Complicating this is the morning traffic. I stand mystified. Then I hear the gas station attendant behind me. He is carrying out the garbage. “Hey, how do you get through this?” I ask. I run. On the other side I hop the guardrail, wander through the fences, and scamper up the embankment. Brightly colored porcelain is in front of me now. I am salivating like Pavlov’s pooch. One fence to go. Suddenly three busloads swing into the lot. They spew hordes of middle schooler. These flow to the doors ahead of me. I am stymied, hung in the fence web. Hope runs out of my body like grease from a french fry basket. Slowing clearing the fence, I look again. I am shocked a second time: this is just a potty stop for the kids, a coffee-stop for the adults! The lines are not serious! I swim to the counter and look up at the menu. McShawarma and McKebab are popular choices. (Several years ago they also tried marketing the McFalafel, a fine sandwich of deep-fat-fried garbanzo-bean-paste-balls. For reasons unfathomable, it never quite took off. A McKebab combo power pak. Not my style on this day. Image source. She looks up. Incredulity is in her eyes. My heart freezes. “Why of course!” Her tone is dismissive. I exhale. I am already feeling McRevived.